Theatre consultant, manager, producer and founding member of the ABTT Ian Albery, has been awarded a Fellowship of the Association. Individuals are appointed Fellow if they "have rendered signal service to the technical aspects of the art of the theatre". 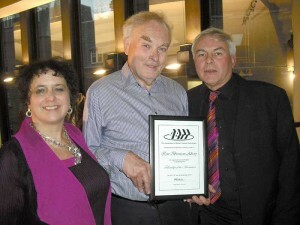 In recognising his outstanding contribution to theatre – including work as both production and technical managers and service as vice-chairman of the ABTT, as well as an executive member of the Society of West End Theatre – Nimax Theatre chief executive, Nica Burns, praised the former chief executive of Sadler’s Wells Theatre, acknowledging the importance of Albery in her own career. The list of ABTT Fellows now reads as follows: David Adams, Ian Albery, Jason Barnes, Fred Bentham (deceased), Richard Brett, William Dudley, Tim Foster, Roger Fox, Roderick Ham, Chris Higgs, Ethel Langstreth (deceased), Iain Mackintosh, Maurice Marshall (deceased), Richard Pilbrow, Francis Reid, Peter Roberts, John Simpson and Ken Smalley (deceased). In picture: Nica Burns with Ian Albery and ABTT chairman Mark White.